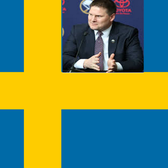 The Sabres trade Erik Rasmussen to Los Angeles for Adam Mair and a fifth-round pick in the 2003 draft (D Thomas Morrow). Hey guys, I heard Darcy is golfing this weekend and needs a ball-washer. He's got a big set of Titleists, so be sure to stay hydrated during this hot weather. Mair for Rasmussen! Brilliant! it's also apparent where he can turn when he needs a ballbreaker. There are more than enough ballbreakers on this board. Well, Morrow is a useless stiff.